There are powerful new tools in Bakugan's Vestroia: the Bakugantlets. Lock it, activate its computer, increase your score by gaining new G-Power boost. 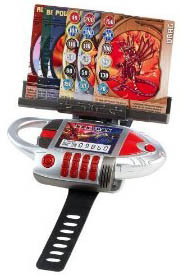 Bakugan Gauntlet is a cool roleplay item that transforms just like in the Bakugan TV show. Holds and displays up to six playing cards. This device also contains a calculator with an LCD screen. Plays lights and sounds. Push button on top front housing to flip up and telescope out card holder. Includes one Bakugauntlet and three ability cards.